This recipe is soooo easy, it should be illegal!!! You may also substitute Golden raisins for a delightful difference. 2. Cups instant white rice – prepared to directions on box. Prepare rice, or use leftovers that are less than 1 day old, and set aside. Prepare pudding to directions. 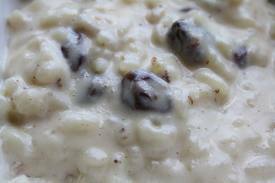 In a large bowl mix rice and pudding together. Add raisins and nutmeg. Cool in refridgerator for 4 hours. Serve cold. This also tastes great warmed up with a dab of whipped cream on top…..SINFUL!!!! !